Google always come up with some design or layout changes to improve Search Experience. This time, the navigation bar present on the top of homepage and search result page is redesigned and the bar will show your name instead of the email ID. 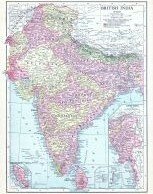 The redesigned navigation bar is having the same navigation links like Web, Images, Videos, Maps, News, Shopping, Gmail and More on left side, but the right side of the bar is changed. Earlier the right side of the bar was showing iGoogle, Search Settings and Sign In links, but now only Sign In and a settings icon is there. Note: Redesigned navigation bar is available on Google.com only. 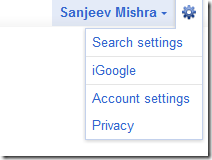 You can sign in using Google account by clicking on the “Sign In” link. 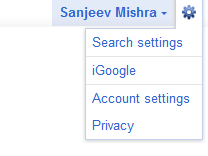 The settings icon will show you options like “Search Settings, iGoogle and Privacy” without signed in. Once you will sign in with Google account, your name will appear on the right side of the bar and email ID will be visible only after clicking on the name. You can browse the list of subscribed services from “Settings Icon ==> Account Settings” which is available in the right most of the bar. The redesigned bar is giving Google homepage and SERP much cleaner and improved look. What is your opinion on that? Share your thoughts on the new redesigned navigation bar of Google.